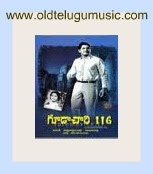 Gudachari 116 is a 1967 Telugu film in which Superstar Krishna acts as a Spy whose Id# is 116. Later on, many sequels are made to this movie with Krishna as leading role and referring to his number 116, similar to the bond genre. Interesting thing is that all the movies, with tremendous success, have shaken the box-office.